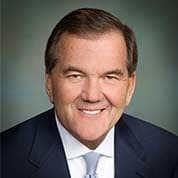 Tom Ridge, the former Governor of Pennsylvania who served as the first US Secretary of Homeland Security, joined NOD’s Board of Directors in 2006 as its Chair. Under Governor Ridge’s leadership, the organization has adopted a strategic focus on employment of people with disabilities. Prior to his appointment as Homeland Security Advisor, Governor Ridge was twice elected Governor of Pennsylvania and served from 1995 to 2001. Governor Ridge is a 1967 honors graduate of Harvard and holds a law degree from the Dickinson School of Law. He was drafted into the army during law school and served as an infantry staff sergeant in Vietnam, where he earned a Bronze Star for Valor. He has tinnitus and a hearing loss as a result of his military service and wears a hearing aid. He was one of the first enlisted Vietnam combat veterans elected to the US Congress when he won that office in 1982, having previously been assistant district attorney for Erie County. Governor Ridge began working with NOD soon after his appointment by President George W. Bush as Homeland Security Advisor. Ridge met with NOD leadership and continued his regular dialogue after becoming Secretary of the Department of Homeland Security. He partnered with NOD’s Emergency Preparedness Initiative for the first ever conference on Emergency Preparedness for Individuals with Disabilities. Under his leadership, the Department of Homeland Security also implemented an aggressive program to hire people with disabilities.